Methodological approaches to the development of forensic support for judicial activity in administrative proceedings. 1. Bihun V. S. Pravosuddya: filosofs'ke ta teoretychne osmyslennya: ideya ta zdiysnennya: monohrafiya [Justice: philosophical and theoretical thinking: the idea and implementation ]. Kiev, 2011.
diss. ... cand. philos. sciences: spec. 09.00.01 – Ontology and theory of knowledge.]. Volhohrad, 2006. 3. 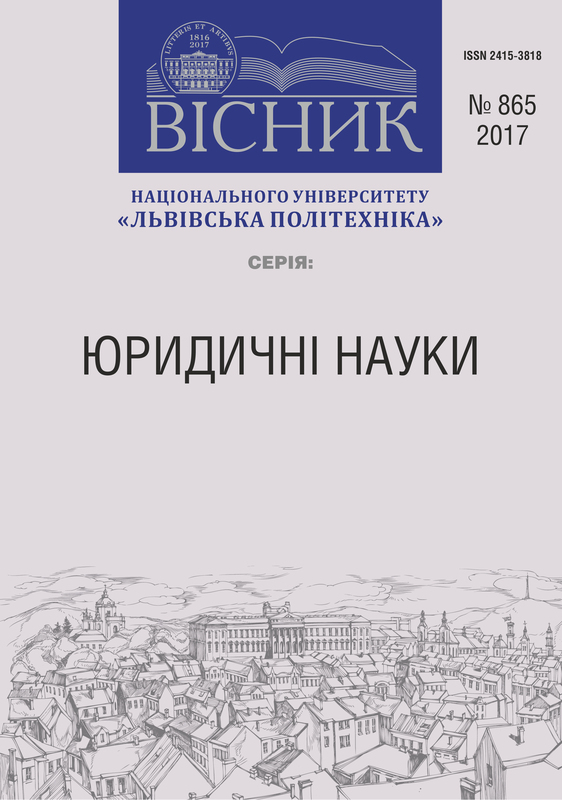 Siryy M. I. Sudochynstvo [Proceedings]. M. I. Siryy, V. M. Tertyshnyk. Yurydychna entsyklopediya. Kiev, 2003. Vol. 5. P. 718. 4. Malyshev B. V. Sudovyy pretsedent u pravoviy systemi Anhliyi [Judicial precedent in the legal system of England]. Kiev, 2008. P. 50. 5. Rabinovych P. M. Filosofiya prava : navch. posibnyk v 5-ty ch. dlya stud. yuryd. vyshch. navch. zakl. [Philosophy of Law: teach. manual in 5 h. for students. Legal. HI. teach. bookmark.]. L'viv : Halyts'kyy drukar, 2014. Vol. 1–2 :Filosofiya prava yak nauka. Hnoseolohiya prava. 232 p.
6. Filosofskii entsiklopedicheskii slovar' [Philosophical Encyclopedic Dictionary.]. Moskow : YNFRA-M Publ, 2007. 576 p.
7. Navrots'kyy V. O. Zlochyn proty pravosuddya : lektsiyi dlya studentiv yurydychnykh fakul'tetiv [The crime against justice lectures for law students]. L'viv : L'vivs'kyy derzhavnyy universytet im. I. Franka. Yurydychnyy fakul'tet. L'viv, 1997. 48 p.